Customize your Nepal tour with our experts for the best Himalayan scenery and cultural experience. We offer the best family holiday suitalbe for family with kids of all ages. Nepal tour with soft adventure of rafting and trekking. See Mr Everest and 3 other UNESCO Heritage sites while in Nepal. All Nepal Tour visits Chitwan, Pokhara and Lumbini driving comfortable distance and relaxing in hillstations. Drive to Bardia national park, visiting pristine hill stations. Also an option for second time visitors. Nepal tour is combination of activities for Himalayan scenery and cultural experience. There are several Himalayan view points, historical places and wildlife safari destinations that one can fly or drive. Hiking and rafting add the flavor of adventure to Nepal tour. With extension of road and airstrip, it is possible to visit pristine valleys of the Nepalese Himalayas without multi-days strenuous trekking. Here we have listed the most popular places to visit and things to do in Nepal. Culturally and naturally, Kathmandu valley resembles the whole of Nepal. For centuries, it has been tolerant to different culture, religion and ethnicity. In the backstreets of bustling town, the medieval Katmandu thrives bedecked in its marvelous wood carvings and terracotta. Kathmandu is dotted with historical Pagodas, pavilions, stone water spouts, stupas and monasteries. Seven groups of them make Kathmandu a UNESCO Heritage site. The Shivapuri national park and protected community forests in the valley rim offers splendid day hike and short trek with Himalayan view. Find touring places in and around Kathmandu. Large portion of Nepal is being protected as National Parks and Wildlife Reserves. Nepal's national parks protects diverse wildlife and exotic bird species. Chitwan and Bardia are last vestiges of Terai which once spread north of Indo-Gangetic planes till the foothills of the Himalayas. Acknowledging the importance of conservation of the region, Chitwan National Park is declared by UNESCO as World Heritage Site. A full board package based in safari lodges give you chance to explore the jungle on elephant back, jeep safari, guided jungle walk, canoe ride and more. Beside being the center of reverence for Buddhist, Lumbini also provides an insight on ancient civilization unveiled by modern archaeological excavation. Series of excavations have discovered various edifices from Buddha's time and even earlier. The Modern Lumbini is 3 sq miles of planned area with Sacred Garden, Monastic Zone and Lumbini Village. The tour of Kapilavastu, Kudan and Ramgram extends Lumbini tour from 2 - 5 days. Bandipur is a hill town overlooking at the Himalayas with the reminiscence of centuries old trans-Himalayan trade. The town is getting more attention of tourists for its easy access and unparallel beauty. One can still see most of the houses with carved windows and slate roofs and the ground floor that opens towards streets for business. With its exquisite panorama of Annapurna and Manaslu ranges, it is often considered as natural view tower. Bandipur at 1,030 m is just 8 km from the Kathmandu – Pokhara highway. It is 143 km from Kathmandu and just 80 km from Pokhara. Stopping at Bandipur will give more insight in Nepal than the tourist centers of Chitwan and Pokhara. Walk around the cobblestone streets of Bandipur to Khadga devi temple, Tundikhel and climb the hillock marked by Thani Mai temple for sunset view over the Himalayas. If you stay another day in Bandipur, walk to the charming Magar village or Ramkot. 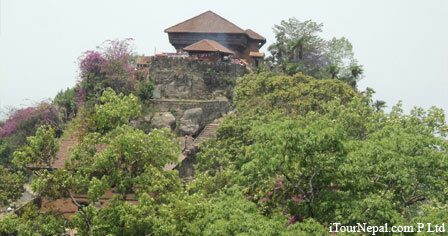 Daman is one of the highest and less visited hill stations in central Nepal. At 2,360 m, Daman offers vista of the longest range of the Himalayas from Dhaulagiri in the west to Mt Everest in the east. It lies 80 km southwest of Kathmandu along the Tribhuvan Highway also known as 'Byroad'. scenic melody of planes, hills and the Himalayas. 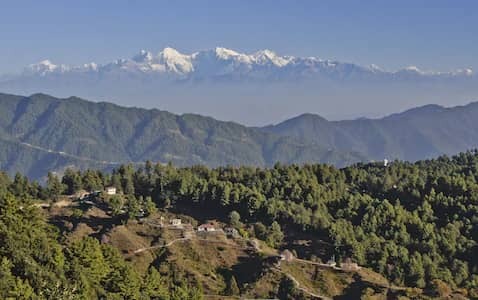 After the downfall of then kingdom in 18th Century, Tansen was reinvented as a Newari trading post on the trade route between India and Tibet. Metalworking and weaving dhaka, the fabric used for traditional Nepali custom are still important local industries. The once remote town of lower Mustang (Jomsom - Muktinath) is a famous tour destination at present . With access by rugged road and several flights, Jomsom and lower mustang region has become a famous destination for those looking for short easy hiking and cultural tour. Just fly to Jomsom and experience the warm hospitality of 'Thakali' in the trans-Himalayas of Annapurna. Enjoy the view of Nilgiri soaring into the sky. Hike up to Dhumba lake, Kagbeni or horseback ride to Marpha and Tukuche. Muktinath is just 2 hrs drive away from Jomsom. 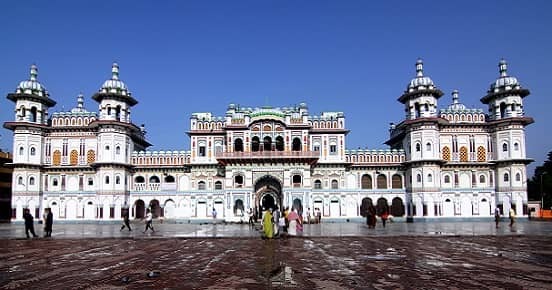 Janakpur is one of the important Hindu pilgrimage sites. It is the capital of Mithila where legendary heroin Sita (Ram’s spouse) from the epic Ramayana was born. The 16th century Janaki temple and the sacred ponds of Dhanush Sagar and Ganga Sagar are the center of attractions. The Vivah Mandap temple is believed to be a place where Lord Rama and Sita were married. Gorkha, the original home of the Shah kings remains a historical and commercial center. It is 24 km detour off the Kathmandu to Pokhara Highway. Even though Gorkha Bazaar is the base for treks in Manaslu region, village tour and day hike could be planned for culture vultures. A climb to the ridge (300 m) is worthwhile for the panaroma of Manaslu Range and historic Gorkha Palace. 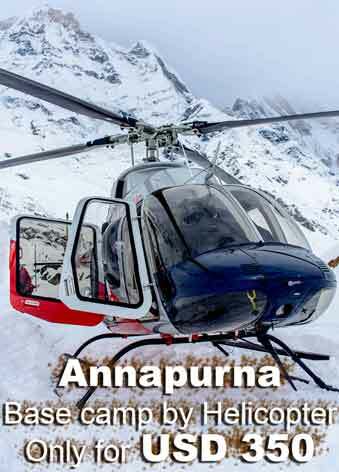 Join group to share the 1 hr charter flight to Annapurna base camp and back from Pokhara. Area : 147,181 Sq. Kms. Longitude: 80° 4’ and 88°12’ East. Topography: From the world’s deepest gorge ‘Kaligandaki to Mt. Everest, the highest point on earth. 5 hours 45 minutes ahead of GMT and 15 minutes ahead of Indian Time. Nepal possesses some of the most outstanding biodiversity in the world, ranging from subtropical Rainforests to Alpine deserts. Climate ranges from Tropical in the lowlands to arctic higher altitudes. Warm clothing are required from November till February and tropical wear from March till October. Previously Hindu country has been claimed secular. 81.3% Hindu, 9% Buddhist & rest Kirant, Islam , Christian. Autumn (Sept -Nov). Winter (Dec -Feb), Summer (March - May), Monsoon (Jun- Aug). Monsoon: June to mid September. Mostly rains a lot and not suitable time for trekking, however some of the days are often crispy clean. Most of the northern belts of Trans-Himalayan Zones are in the rain shadow which provides rain free trekking. Government offices open from 10 to 17:00 hrs in summer and till 16:00 hrs. in winter. On Fridays these offices are open till 15:00 hrs. only. Government and most other offices work six days a week. Saturday is the official weekly holiday when most of the shops are closed. Museums remain closed on Tuesdays and other Govt. holidays. 220 Volts AC - 50 Cycles through out the country. The highest mountain peak in the world (Everest - 8848 m). 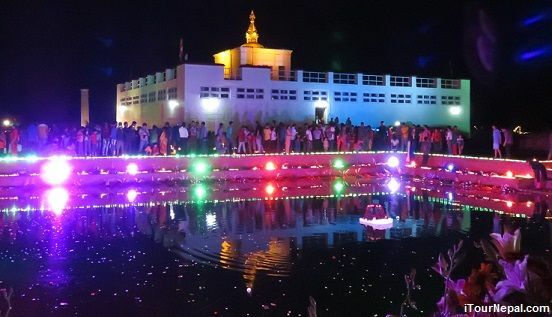 The birthplace of Lord Buddha (Lumbini). The Living Goddess (Kumari) who is worshipped and taken in a chariot procession annually. The best place in the world to study Tibetan Buddhism. The largest selection of books on the Himalayas and mountain climbing. Kathmandu the capital city with as many idols as men and as many temples as houses. A hotel in Everest National park at an altitude of 3870 m, claimed to be the highest hotel in the world (Hotel Everest View). 600 indigenous plant families 319 species of exotic orchid.